There are a lot of perks to owning your salon, but with freedom and flexibility also comes pressure to constantly have clients in your chair. 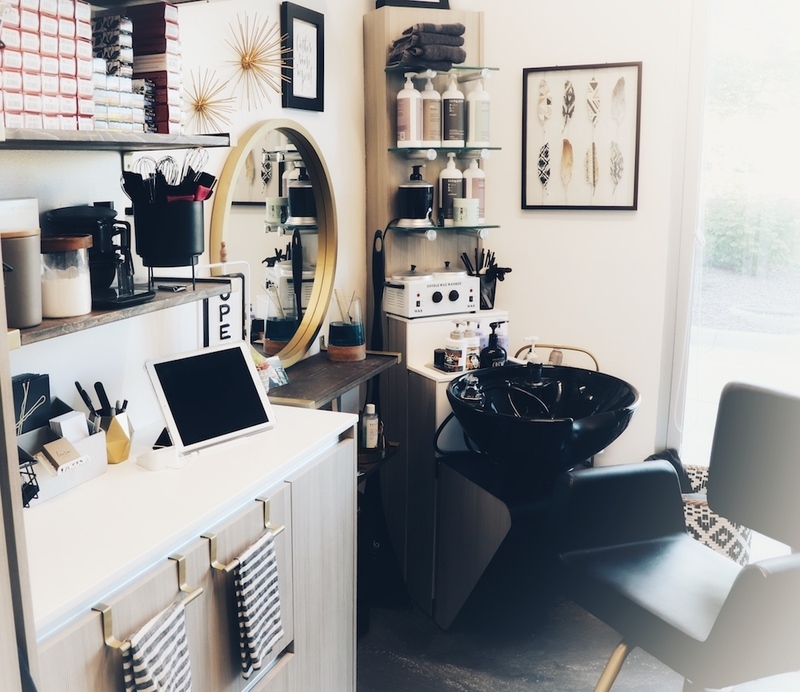 As a Sola salon owner for the past 7 years, I've learned that one thing that makes salon ownership less stressful is having my books filled at least six to eight weeks out. But to have them filled requires a healthy clientele. Here are the do's and don'ts I’ve learned for building and nurturing a clientele. 1) Identify your target market: This is by far the most important thing you can do when building your clientele. Yes, there are entire college marketing courses on this topic, but to simplify: Find your tribe, love them hard. If you have a clientele already but its not as big or loyal as you’d like, write down the names of your top 5-10 favorite clients. Yes your favorites - not the ones who necessarily spend the most money or come back the most often, but the people you genuinely enjoy. If you don’t have a clientele yet, pretend you do. Daydream about who you would want as a client and write down a few things about your imaginary tribe. Now look at your list. What do they have in common? What makes you two click? Is there a pattern? Get specific. You’re not for everyone, and that's ok. You’ll be too much for some and not enough for others, but it doesn’t matter because not everyone is your people. You don’t want to waste valuable time and money trying to appeal to people who won’t mesh with you. Once you’ve figured out some of the similarities between your VIPs (real or imaginary) dig deeper and write down where you think or know they might shop, what brands they might like, and the types of bars or restaurants they might frequent. Then stalk those brands. Go to their websites and see what their common themes are, color schemes, simplicity versus glamour, etc. This research will help you market yourself specifically to people most similar to your VIP’s, aka your target market. 2) Build your personal brand: Once you’ve identified your target market you need to create your personal brand. Fortunately you should have an idea of brand strategies that work from the research you did on your target market. You want your brand to showcase your personality, but above all you want it to appeal to your target clients. Brand your business cards and literature in a way that speaks to your customer. Sites like zazzle.com & vistaprint.com have tools, images and fonts you can use to create a logo for your brand. If you don’t comfortable designing something yourself, there are graphic artists on Etsy that will create a design for as little as $25. If you’re serious about your brand, there are sites such as 99designs.com that can create a very target specific logo for your brand in the range of $99-399. This isn’t an area to skimp on. Don’t rush through it. Be picky. You don’t necessarily need a creative salon name either. Your name can be your brand. Whatever you do though, be consistent. Your brand isn’t just on your door and your business cards these days. It's on all your social media channels and your website. Your brand should be uniform across all platforms. Don’t call yourself @SaraJaneStyling on Instagram and “Sarah’s House of Hair” on Facebook and @SJHouseofHair on Twitter. Pick one, make sure the usernames and domains are available across all platforms and get those profiles set up and linked together. It's easier for clients to remember be able to find you online. 3) Create a website: Now that you’ve got your tribe and you’re building your vibe to attract them, you’ve got to get a website. Your website is what people will want to rifle through to get a first impression of you once they’ve become aware of you, whether their friend gave them your card or they came across you on Instagram. And we are so lucky that Sola makes it easy to build and edit our own Sola site with Sola Pro! Your website is essentially your resumé. It's what your client will use to decide whether or not to hire you. Like it or not, your presence online is more often than not the first impression people have of you. So how can someone decide if they want to sit in your chair if they have no first impression to base it off of? Taking it one step further, most clients also prefer online booking to calling in to schedule. If you don’t have a website, you won’t have online booking. If you don’t have online booking a lot of people will write you off without a second thought. It's just the truth; people would much rather click around and find a reservation that suits their schedule than talk on the phone shooting back dates and times until one can be agreed upon. SolaGenius users can now take it one step further and add a "Book Now" button directly on their Instagram! Creating a professional website will set you apart from other studio stylists and put you on the same playing field as traditional salons when it comes to your digital identity. If you’re shaking your head at me and thinking "I'm not not tech-savy enough to build a website," I’m telling you you’re dead wrong. There are so many options for building a site and purchasing a domain name (which should be uniform to your social platforms as well) that you’d be doing an incredible disservice to yourself to ignore this. Visit wix.com, wordpress.com or simply google “how to build a website” and you’ll find a host of options for a tech novice. Utilize the Sola Pro packages available and create your website as simply as filling out the in app survey about yourself. Reach out to friends and family to see if someone wants to help you navigate building a website. You might be surprised to discover your site could be helping someone with a homework assignment or a work project. The bare bones basics you should have on your site are: online booking, your professional bio, a gallery of photos of your work, contact info & a list of your services and pricing. From there the sky is the limit, you could add a blog or YouTube channel depending on where your interests lie. Your website should also direct people to your social platforms where you’re actively showcasing your work and visa versa. Again, if you’re new to social media, there are tons of great options for you to learn from. Britt Seva does a free Facebook Marketing for Hairstylists virtual course a couple times a year. Jamie Dana teaches a free virtual Instagram course called “Oh Hot Gram” for stylists periodically as well. Learn your way around a website and social media platforms and I guarantee you’ll see your clientele grow. 4) Replicate your vibe offline: Now that you’ve identified who you want to work with, branded yourself, and built your online presence, you need to make sure you’re worth the hype. And I’m not talking about your technical skills. Your space needs to be clean and inviting. You should have beverages and maybe even snacks. Magazines and literature are old news (get it? 😉). Get creative. 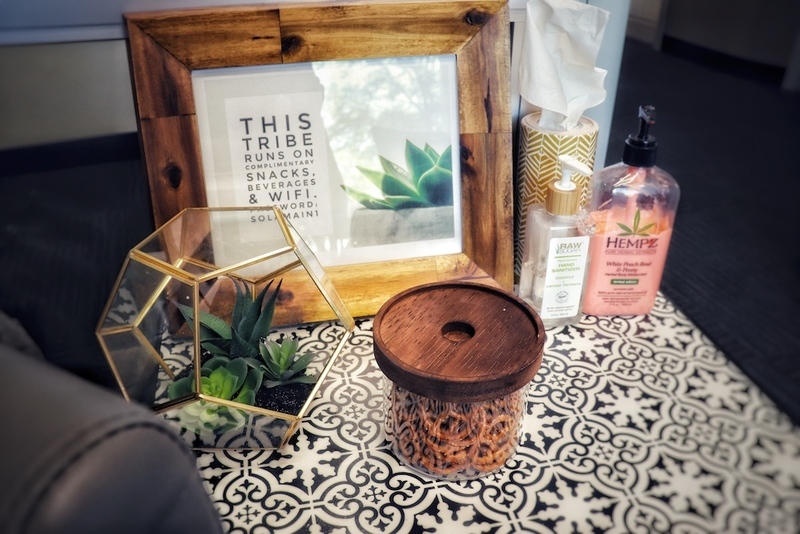 Differentiate yourself by making your amenities special and unique for your guests. Now that they’ve found their way to your chair, your clients' experience with you is just as important as the finished product on their head. I’ll say it again: their experience with you is just as important as their hair. Make them feel pampered, make them feel heard, be all about them for the duration of their visit, be genuinely interested in them! This should be easy to accomplish authentically because you’ve put in the work to attract your tribe, your ideal clients, your VIPS, the ones you truly do care about and enjoy. If you’re doing all the above correctly it will be easy to give every guest an amazing experience because you’ll start to eliminate the clients whose names makes your stomach clench when you see them on your books. Your clientele will begin to transform into a list of your favorites every single day. 5) Get them coming back: Now that you’ve taken all the steps to get the right people in your chair, you need to keep them coming back. Pre-scheduling their next reservation is vital. It's both easier and cheaper to maintain an existing client than it is to attract a new one. Practice different verbiage until you find what feels comfortable to you. My script used to be, “You’ll probably be due to come back in six to eight weeks. Do you have any events or trips we need to try to work around for your next appointment?” Or, “You’ll probably be ready to freshen this up in five to seven weeks. Let's schedule it so we make sure you get the primetime spot that works best for your schedule.” To be honest, I don’t have to say much. My guests have either gone online and booked their next three appointments or they already have their calendar up as I’m checking them out and telling me when they want to see me again - not because I’m just soooo wonderful, but because I have built genuine bonds and essentially trained my guests to schedule early. They know now that if they don’t snap up their favorite times they’ll be waiting extra weeks or even a month to see me. It's a stylist's dream! 6) Love them hard: Once you've been able to refine your clientele to your favorites every day of the week, you need to nurture them. Take it a step beyond your lovely amenities and excellent guest experience. You’ve found your tribe. This is the love them hard part. Research referral and loyalty programs and then design one that works well for you. Make sure it doesn’t bleed out your profits, but still gives back to the guests who give back to you. 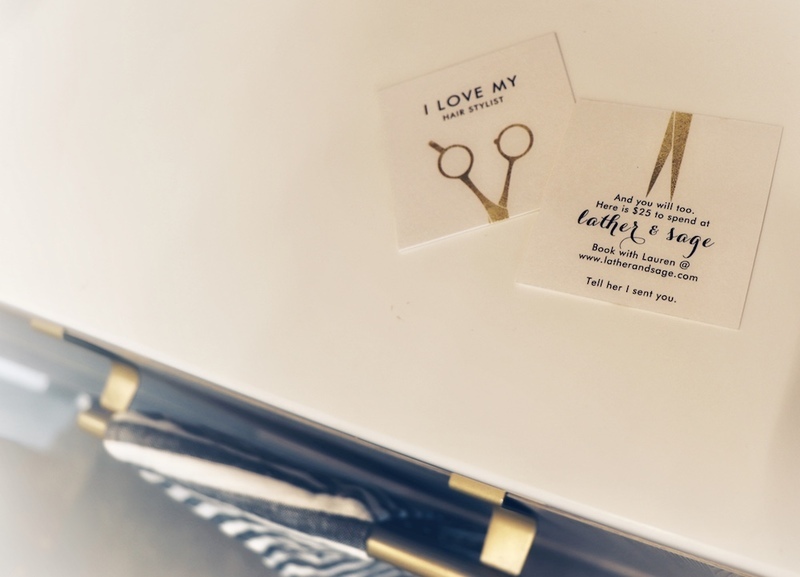 Referrals: The referral program that works best for me is a simple card that says, “I love my hairstylist!” on the front and on the back it elaborates, “And you will too! Use this card for $25 off at Lather & Sage, tell her ________ sent you”. My guests give out the cards. I get a new guest that is 9 times out of 10 organically within my target market. I then send the referring guest a $25 gift card to spend with me as well! Loyalty begets loyalty. $25 per referral might be really high or really low for you. Figure out a price point or percentage that makes sense for your business. It will be different in Los Angeles versus Texarkana. Loyalty program: The loyalty program I’ve gone with is a punch card, where after every third spend of $75 or more, my guests receive a complimentary luxe conditioning treatment. You don’t have to model your referral and loyalty programs this way but do more than just “send me 3 and get one free” or 10% off after 10 punches. Those aren’t enticing enough to garner real participation or anticipation. By now you should have a really good idea of what appeals to your tribe. Create a package that treats them and makes them feel nurtured. They’ll be lifers for it. If you want to take it even further, begin sending your guests birthday cards, or little love notes via snail mail - yes with a stamp and everything! Budget to save a little from your August back to school rush to buy your top 20 guests a small Christmas present. You can even send all your clients a holiday card in the mail! Excellent customer is the only way to play the game. Do more for your guests than anyone else would be willing to do and watch your business flourish. 1) Don’t get too busy. Wait what??? Hasn’t this whole post been about growing a thriving clientele? It has, but don’t outgrow yourself by getting too busy for your tribe. Don’t be so overbooked that you’re perpetually running 20 minutes behind schedule. You must respect people’s time. Constantly running late is even more triggering and reason to leave than hair they don’t love. Make sure you’re generally running on time and operating efficiently and consistently. Don’t lose the “margin for magic,” as Britt Seva says. That margin is the time you leave yourself so that you’re not so slammed you can go ahead and add on a conditioning treatment if your guest mentions that the summer at the pool has been hard on her hair. It’s the time you can spend consulting a little longer when your client is asking for a big, uncharacteristic change and you also happen to know she’s in the middle of a divorce...so you may need that 10 extra minutes to talk her out of a pixie with 1N all over when she’s always been a shoulder length blonde. Book yourself so that you have some play in your schedule. It could be 5 minutes it could be 50, find what works for you and your tribe. Does this mean you can’t double book? Heck no. Double booking by a stylist who is comfortable and capable, can be amazing. Assess who you’re stacking together and their compatibilities. Address it with them as well. When booking say something like, “I’ll be applying your color while another one of my favorite people is processing so next time will be a fun little party!” Or, if you don’t know at pre-booking, mention in your consultation something like, “I’ve got another person coming for their color while you’re cooking today so you can either have a little break from me partway through our appointment or we can all have a little party!” Just inform people this is what you’re doing, don’t ask permission and execute it well. Double booking the right way can make the studio salon experience more like a traditional salon experience which can be a nice little change for your clientele. Again, assess your tribe’s personalities and preferences and decide what’s right for you. 2) Don’t you dare ever stop learning. Again, I’m not just talking about your technical skills, because honestly that should go without saying. Keep learning and growing from other stylists and entrepreneurs. Read books, attend seminars, listen to podcasts. Expand your mind for business and entrepreneurship and you’ll reach a point where you can no longer accept new guests. I bet it will happen sooner than you think! Erin Dimond is a fitness mogul who I follow who recently posted, “Grinding 70 hours a week without making time to read or listen to podcasts makes about as much sense as chopping down a tree with a dull axe because you don’t have time to sharpen it. Sharpen the axe then do it in 1 hour or hit the tree 500 extra times and do it in 3 hours?” Whoa. Make time to sharpen your axe. Follow and engage with other stylists, especially other Sola stylists on Instagram! Listen to Big Money Stylist, The Thriving Stylist Podcast or The GaryVee Audio Experience through a podcast app. Consider hiring a business coach or enrolling in a business enrichment course. Check out books at the library. Attend Sola Sessions. And don’t limit your resources either. I draw inspiration from all over the map. Britt Seva, Jamie Dana, Jess Lively, Gary Vaynerchuck, Erin Dimond, Courtney Carver, Kate Bryan, Kilee Nikels, even Dax Shepard, just to name a few. They are hustlers, inspirations & influencers in the most positive sense of the word, and I use their sparks to light my own fire. 3) And finally, don’t underestimate or undervalue yourself. You can do this. You can have the clientele of your dreams. When you build it right, they will come. And when they do, they’ll be willing to pay what you’re worth, so charge accordingly! If you’ve made it this far, may I just say you are definitely a member of MY tribe. So please reach out. You can find me on Instagram @latherandsage, shoot an email to lauren@latherandsage.com or call/text 720.633.0800. Let's collaborate, let's be friends, let's be #SolaFam.